We are taking reservations for current and upcoming litters. Please check Available Kittens page for availability, pictures and additional info. We are always available to assist you with any questions or concerns. Kittens are reserved once a deposit is received. The deposit is non-refundable. The remainder can either be paid in person or through PayPal. You may use any major credit card via PayPal without having a PayPal account. For more details on how to use PayPal to purchase your kitten please contact us. Our kittens are Vet examined, neutered/spayed prior to placement. All kittens come with a Written Health Guarantee. These kittens are guaranteed against contagious disease at time of purchase. The kitten must be examined by a licensed veterinarian, at purchaser’s expense within 3 days (except Sundays and holidays) from the date of adoption to qualify for this guarantee. If the veterinarian finds any health concern, the buyer may return the kitten to the seller within 24 hours along with explanation from a veterinarian for a full refund or another kitten. All kittens will be TICA registered, like their parents. We offer discounts for anyone buying multiple kittens. 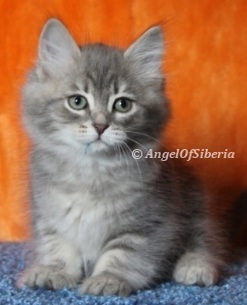 You can share with us your experience on raising hypoallergenic Siberian cats. We reserve the right to withhold breeder’s choice kitten(s) from sale, and the right to refuse sale to anyone.